Mon, Apr 15, 2019, 07:48 pm SL Time, ColomboPage News Desk, Sri Lanka. Apr 15, Colombo: The R&D Team of Sysco LABS Sri Lanka conducted a special session on Machine Learning for the students of the University of Colombo School of Computing on 30 March 2019. 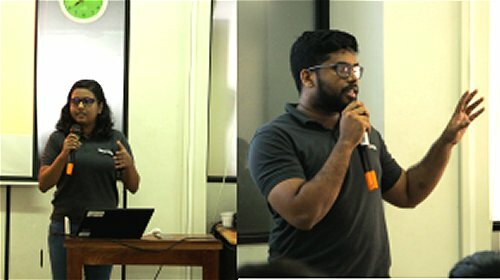 The hands-on workshop - conducted by Madushanka Fonseka (Senior Tech Lead), Deshani Geethika (Software Engineer), Pivithuru Amarasinghe (Software Engineer), Sidath Munasinghe (Software Engineer), Isham Mohamed (Software Engineer) and Ridmi Jayasena (Senior Project Lead) - included an introduction to Machine Learning, its applicability and development areas, and was one of multiple workshops organized by the IEEE Computer Society Student Branch Chapter of the University in the lead up to "IntelliHack 2019". The hackathon and its supporting workshops, aimed at building awareness and giving undergraduate students a comprehensive foundation on building algorithms, decision making and finding solutions, is set to take place on 4 and 5 May 2019 at UCSC and will be open to all undergraduates from local universities.